Beetroots are packed with many nutrients and is a natural blood purifier. It is good to include it in our diet once in a week. I prepare this poriyal often in my house. It is a very simple stir fry which goes well with rice. 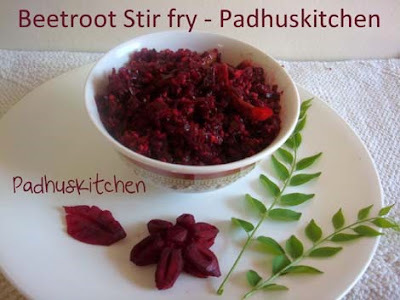 Today we will learn how to make beetroot stir fry/poriyal following this easy recipe. Wash, peel the skin and chop beetroot. You can also grate beetroot if preferable. Slit green chilli and keep it aside. Heat 2 tsp of oil in a pan or kadai, add mustard seeds, when it splutters, add urad dal and hing. When urad dal turns golden brown, add green chillies and curry leaves. Then add the chopped or grated beetroot and salt needed. Cook covered on low heat, stirring from time to time until beetroots become tender. You can sprinkle water in between to prevent it for getting burnt. Once it is cooked, add grated coconut, mix it well and switch off the heat. Serve as an accompaniment with rice. I love this simple poriyal with beetroot..
Great poriyal but i don't like beetroot. Congratulations you have been given 2 awards. Please collect them here. healthy and colourful poriyal..bright and beautiful colour.. Thanks for sharing, that was really delicious!! I tried this recipe and its awesome. I prepared this today & tasted so good. It is different from my usual beetroot recipe(using sambar powder). I added your recipe to my cookbook. Thanks Padhu! Can we add red chillies instead of green chilli?